The desire of parents in cultivating gratefulness from happy and healthy children has been documented in numerous guides, forums, seminars, and postings. Furthermore, the abundance of gratitude in within the family is a sign of a healthy and fruitful relationship among its members. 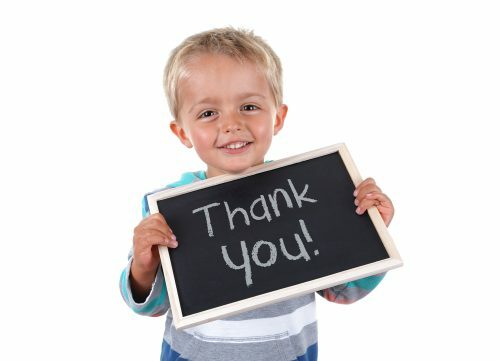 Just because your child knows how to say, “Thank you,” doesn’t mean that he or she is already grateful. That’s not how gratefulness works. Children might utter something they don’t usually mean. They can show their utmost appreciation backed by their sweetest smiles in the absence of inner gratitude. Although, this kind of attitude may help your children surpass the expectations of society, but not actually meaning what they say could make them miss out on what really matters. Being truly grateful is a stepping stone to building a stronger relationship with society, a more improved version of satisfaction in life, and a well-enhanced mental and physical well-being. Kids imitate their parents because, in their eyes, their parents are the models and the superheroes in their lives. As parents, showing gratefulness will foster other behaviors of gratitude and your kids will, most certainly, engage in the act of being grateful as well. Express your appreciation loudly. When you receive something, teach them on the positive effects that the gift brings in your lives, and analyze how it makes you feel, that’s the time that you truly are grateful for its presence. Let them feel how important whatever you received is to you. Through this, no matter how small the item is, your kids will still know how to value the gift and the giver. Magnify the importance of gratitude when presented with the opportunity to do so. Always see every moment as a chance to teach your children how important gratitude is. Talk to them about the positive side of every item received or every event experienced. Ask your children what they’ve noticed and how it changed their lives. By enforcing this attitude, you are teaching your children how to connect with their gifts which will eventually grow to further motivate gratefulness towards other things in life. Missed gratitude is something that you should to your child about. Not only are children showing signs of entitlement, but a missed opportunity to find gratitude in a certain experience is an infuriating and embarrassing feat for the parents. First and foremost, converse with your child about those moments, ask them about those times when they refused to show gratefulness. Just because your children have failed to seize the chance to show gratefulness, doesn’t mean that they don’t have a valid reason. By listening to what the child has to say, you are paving the way to avenues of openness and trust. The state of being grateful is more than just a behavior that children have to learn; it becomes an integral experience of their inner self. Therefore, we must embed in our children that when people give something, regardless of the cost or size, they have to notice it, ponder on why it was given, have a deep connection, and show appreciation.